Tyus Battle (25) drives to the basket against Texas Southern. The sophomore guard took over with 16 points in the second half. 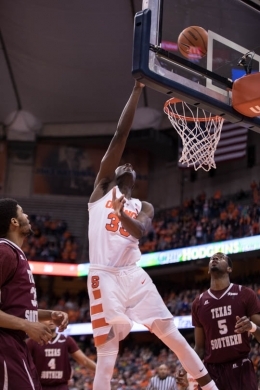 The Syracuse Orange (3-0) defeated the Texas Southern Tigers (0-4) 80-67 to win their third straight game to open the season, while extending the Tigers’ losing streak. 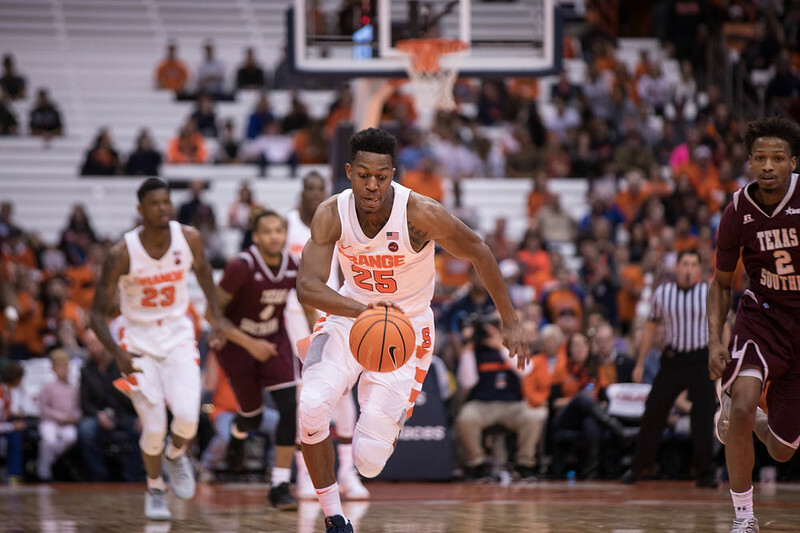 If there was ever a question of who the Orange could trust if their leading scorer, Tyus Battle, wasn’t in the game, that question got answered in the first half: Geno Thorpe. Thorpe averaged seven points through the first two games of the season. When Battle left the game against the Tigers with two fouls with just under 10 minutes left in the first half, Thorpe took over. He led all Syracuse scorers in the first half with 13 points. Freshman Forward Bourama Sidibe had eight points, 12 rebounds and five blocked shots Saturday night against Texas Southern. The Texas Southern defense wasn’t showing him as much respect as they had Battle. Both teams run similar zone defenses, so when Battle was on the court, Texas Southern easily ran double teams out to him to force him to pass the ball. No such double team came to Thorpe. Outside of Thorpe, Syracuse ran cold from the field in the first half, shooting 30 percent excluding Thorpe’s 83 percent from the field. After the game, Syracuse coach Jim Boeheim said that zone defenses like Texas Southern’s are hard to get going against, but his team acted as if they hadn’t even seen a zone before. This led to a stagnant offense that was bailed out by Thorpe. Boeheim noted that they could have put Battle back into the game in the first half if they needed him. The effective combination of Thorpe and junior guard Frank Howard meant that Boeheim could leave him on the bench a bit longer. When the second half opened, the Orange defense refocused and a fresh Battle started scoring with abandon. Boeheim saw his team move the ball better in the second half which kept Texas Southern’s defense from sending as many double teams to Battle. Battle made two 3-pointers and brought the Dome to life with a baseline spin move into a one handed dunk. Scoring 14 points in under 9 minutes, Battle helped the Orange open a 21-point lead by the 11 minute mark. The Tigers never got closer than 12 points after that as the Orange led for almost 29 minutes of the game. Battle led all scorers with 21 points. Thorpe didn’t score another point in the game, but he had done his part, taking over until Battle returned. Despite the comfortable win, Boeheim still expressed some displeasure with his team’s defense after the game. Boeheim’s team experienced some notable mental lapses on defense that resulted in multiple lobs and dunks by Tigers players lurking behind Syracuse’s centers. Both teams finished the game with five players scoring double digits, with Syracuse freshman forward Marek Dolezaj falling one rebound shy of a double-double. Dolezaj and fellow freshman forward Oshae Brissett combined to grab 19 of Syracuse’s 40 rebounds and seemed to be in perfect position for every missed shot. Moving forward, Boeheim has higher expectations for his team’s defensive efforts and will not use the youth of the team as an excuse for ineffectiveness. Next, the Orange continue their six-game homestand by facing the Oakland Golden Grizzlies on Nov. 20 at 7 p.m. in the Carrier Dome as part of the Hoophall Miami Invitational. The Hoophall Miami Invitational is a four game multi-team event that concludes with Syracuse facing Kansas in Miami on Dec. 2.